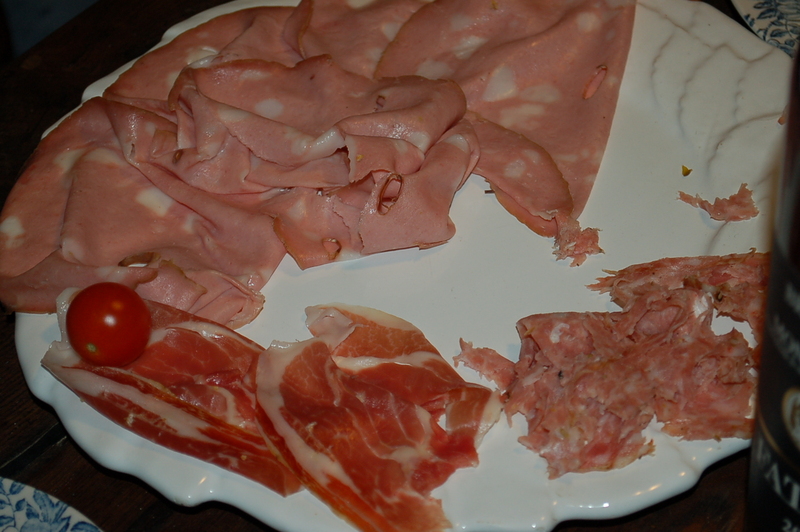 Late Dinner at Colle Puccioli – Part 1 | Crappy Kitchen - Good Dinners! This was an absolute whirlwind of a visit, but I will never forget it. I am going to center my accounts around the meals, so there will be three posts. This wonderful trip into the Tuscan countryside came about because of that “six degrees of separation” theory. The theory is that every person can be connected to any other person on the planet through a chain of acquaintances with no more than five intermediaries. In my case the degree of separation was only two, and that in itself is amazing considering I am from Ireland, married an american who went to college with a guy (Shawn), who in turn met another guy ( both potters), while on a summer course in North Carolina. This guy (Chris), went to Italy over a decade ago, and began living and working in Cortona. 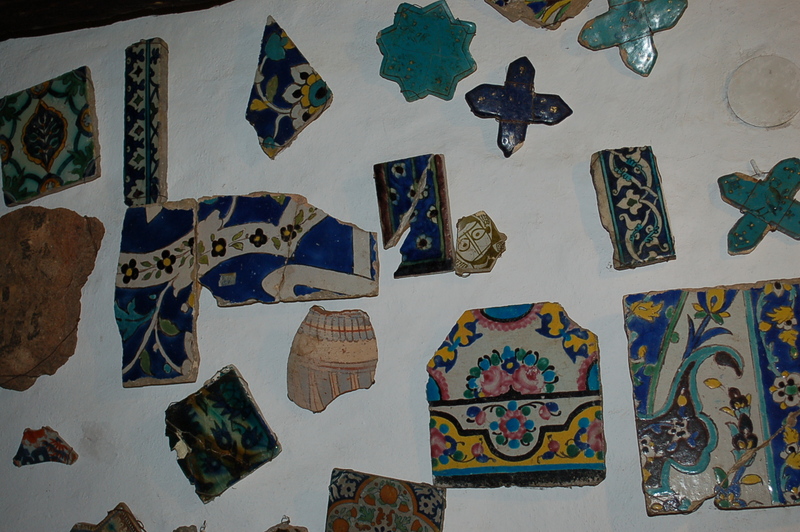 He became passionately interested in ancient Italian pottery, and in 2009 had a pottery show in Rome exhibiting his pots and ancient pots side by side, ( Medieval Maiolica, Modern Interpretations, displayed medieval ceramics from the permanent collection of the Museo nazionale del Palazzo di Venezia in Rome, with contemporary interpretations by Chris). The show catalog in the museum was perused by a Mr. Tom Liepsner, who promptly called Chris hoping to gather more information about his vast collection of ancient pots, and they bonded instantly. 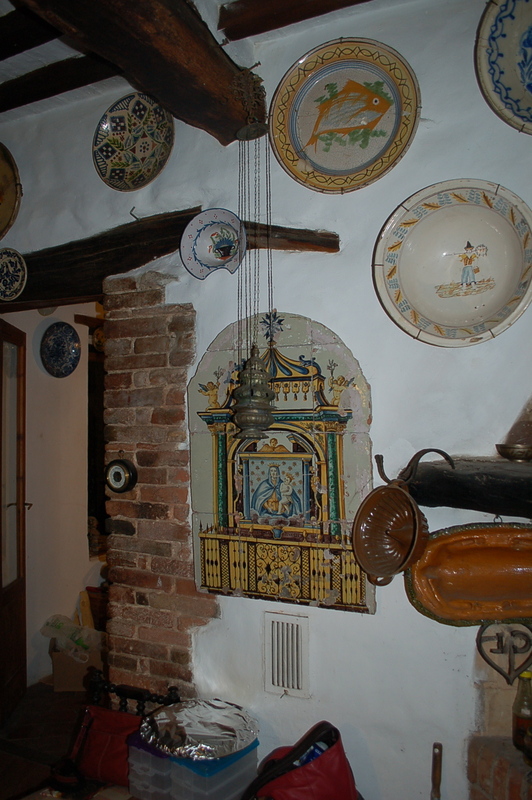 There is also the added observation that the craftsmen who made the pots in the 14th century were the true links in the chain. Now, here I was in Italy with Chris and Shawn, and Shawn called Tom and planned for us all to visit (unfortunately Chris was not here, but he was with us in spirit). Shawn gave me a brief description of where we were going and who Tom was. 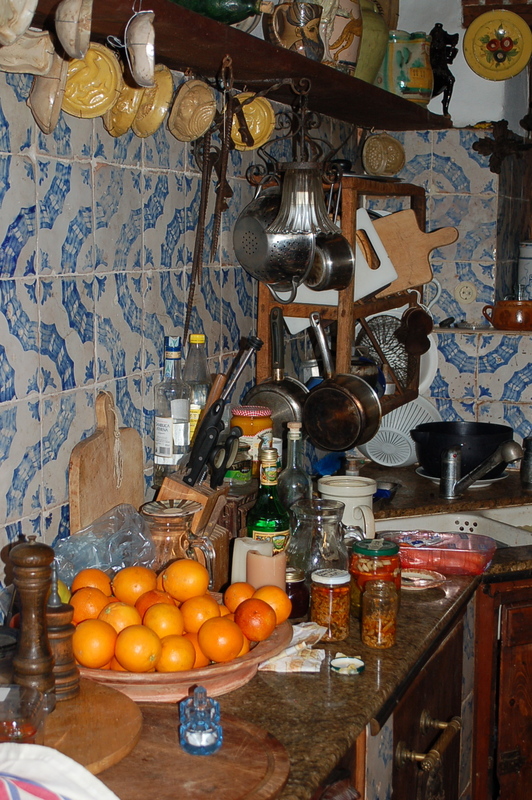 He told me to pack ingredients for cooking ( and to try not to go overboard, as I always tend to do where food is concerned), and, to have my camera handy. I was very curious and waited for our saturday evening departure with impatience. The trip happened directly after a beautiful, but exhausting day in Orvieto (read the post “lunch in Orvieto with John” if you’re curious). We jumped from the bus (which broke down, delaying our departure even further), and within 20 minutes (during which time I gathered our supplies at lightening speed) transferred to a monstrosity of a van, and down the hill we careened! 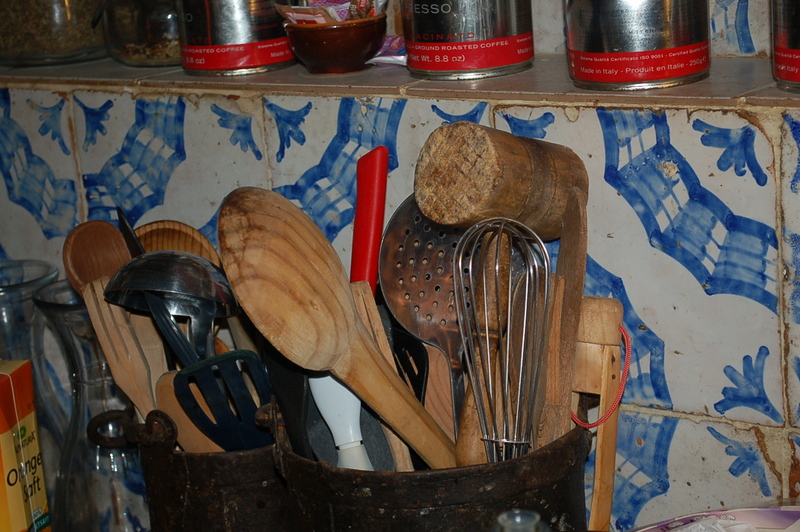 I was happy to see all of these pots stuffed with every utensil I would use while cooking! The van took us from Cortona to about 30 miles southwest of Siena. The road was so convoluted and windy, it took all my powers of concentration to not play the role of Linda Blair in The Exorcist,(slightly corny analogy, but worth mentioning how nauseous I felt). It was dark when we arrived and the only thing I could make out in the close distance was the ancient Etruscan town of Chiusdino. It was strange arriving so late to cook dinner with someone I didn’t know, but I felt ready to meet new people, and be in a real Italian country house. Various meats to nibble on. The whole scene that unfolded before me upon entering the house, was akin to stepping onto a lavish movie set, or maybe more like I was in a dark movie theatre watching all of us up there on the screen, (have you ever seen The purple Rose of Cairo?). Yes, it did feel surreal, and I was happy to have entered this dream-like house, and get to mingle with the inhabitants. We all piled in and were introduced to our host Tom and two of his good friends Ninfa and Monica, who were visiting from Siena and Milano for the night. The introductions were all smiling, embracing and laughter. Ninfa knew I was interested in food and immediately drew me to the table to describe what they were nibbling on before we arrived. She was passionate about absolutely everything, but was most interested in having me try the soft pecorino cheese. Ninfa told me how she had lived in the United States with her american husband for 20 years and how eating seasonally was something she missed. This cheese was the perfect example. It could even be described as micro-seasonal, as it is only available in March. It is made from the “first milk” of the ewe. Apparently, it was the brain-child of a shepherd who invented Marzolino; making a cheese from the season’s first milk that they could produce, while waiting for the other pecorino cheeses to mature. 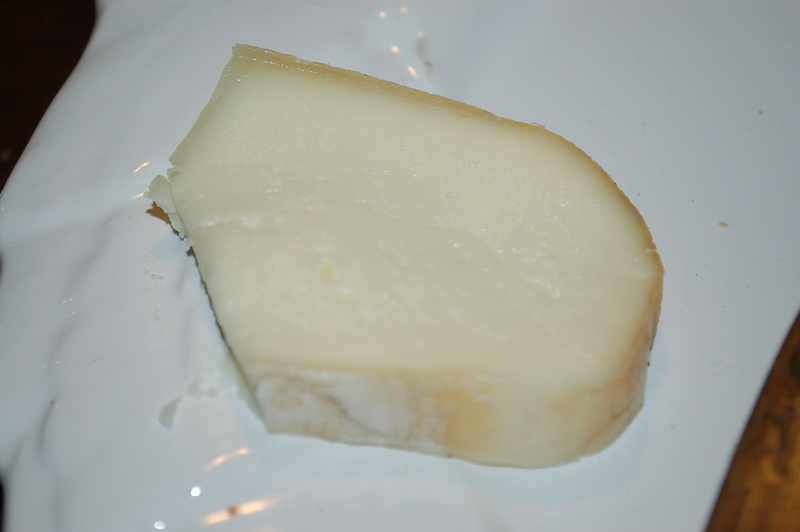 It has a soft rind, and takes on the flavors of the first grasses and herbs eaten by the sheep. Truly a treat for me, and I sampled as much of it as I could throughout the evening. Tom, our gracious host bustled around in his seemingly casual way talking to everyone, pouring wine, and giving orders. Yes, he didn’t seem to stand on ceremony, and gently told everyone what to do, or how a thing could be done. He also took the kids outside with a flashlight to explore his impressive playground, complete with giant trampoline, and swimming pond, complete with zip-line! 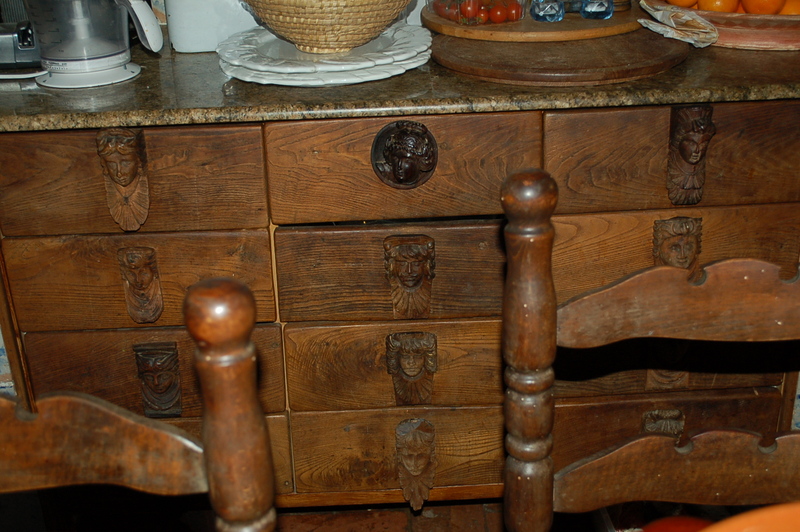 drawers full of silverware, napkins, big utensils, and all matter of kitchen equipment. Tom’s place is an Agriturismo which is the word “agriculture” and “tourism” in Italian smashed together. 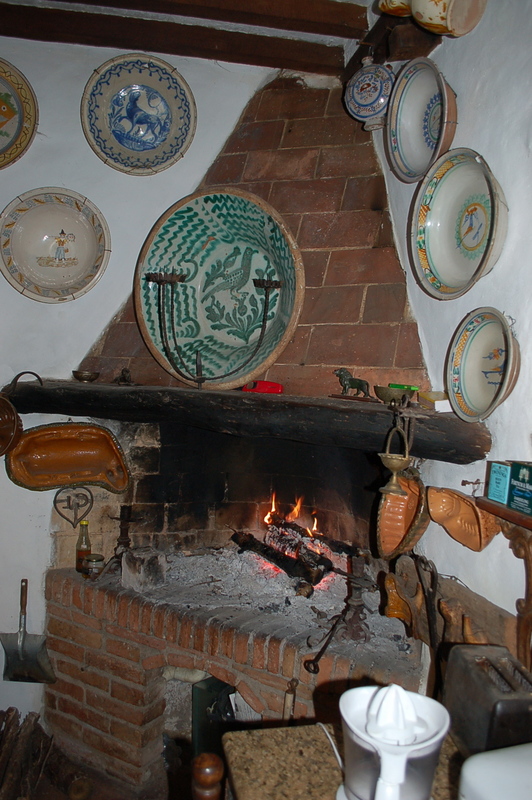 An Italian agriturismo generally serves food to guests prepared from food produced on the farm, or from ingredients grown or raised locally. At some locations guests can participate in the activities surrounding the farm, like weeding the garden (more about my experience in that department in one of the posts to follow). When small-scale farming in Italy became less profitable,(1950’s – 1970’s) farmers abandoned many farms to look for an income elsewhere. 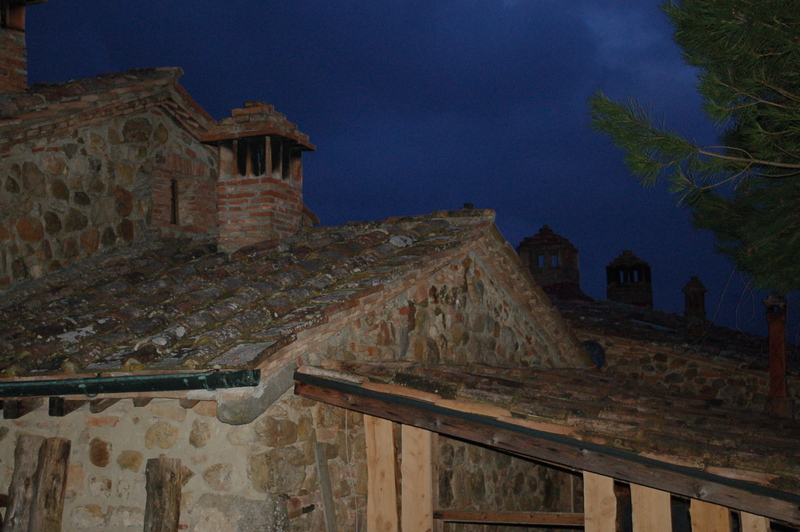 To save these farms (many were very neglected, with buildings in very bad disrepair) in 1985 a law defined Agriturismo, and many of these estates were restored, many for agritourismo. 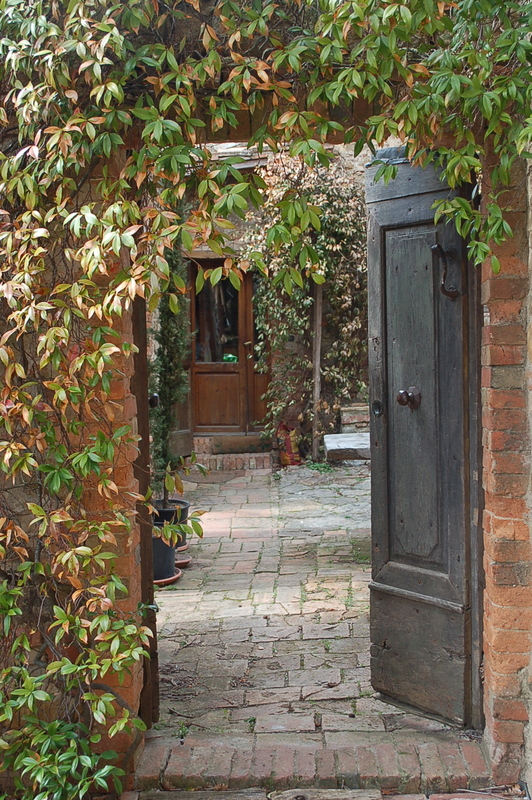 This helped to save these small farms, which started producing again, while also giving the vacationers a chance to fully experience Italian rural life. Tom was Mr Agriturismo as far as I was concerned. He stumbled upon the property in 1982. It was literally falling down; no roof, no electricity, no anything in general. But, Tom saw the value in the place. It beckoned him to turn it into what it is today, an idyllic set of dwellings set on a Tuscan hillside with a view of the spectacular countryside, including an imposing view of the Etruscan town of Chiusdino. We sat down to dinner after 10pm and the spread was obscene. 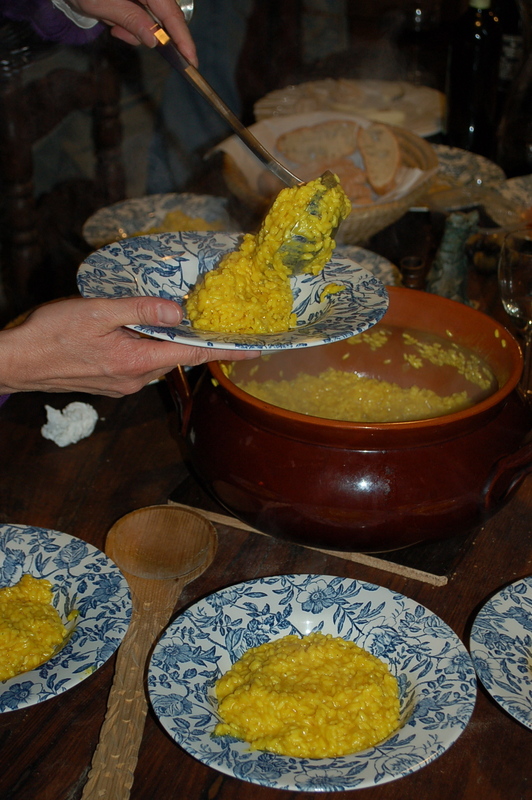 My plate was filled with everything from saffron risotto to a meaty ragu. All of us strangers cooked together in Tom’s fantastical kitchen with the greatest of ease. 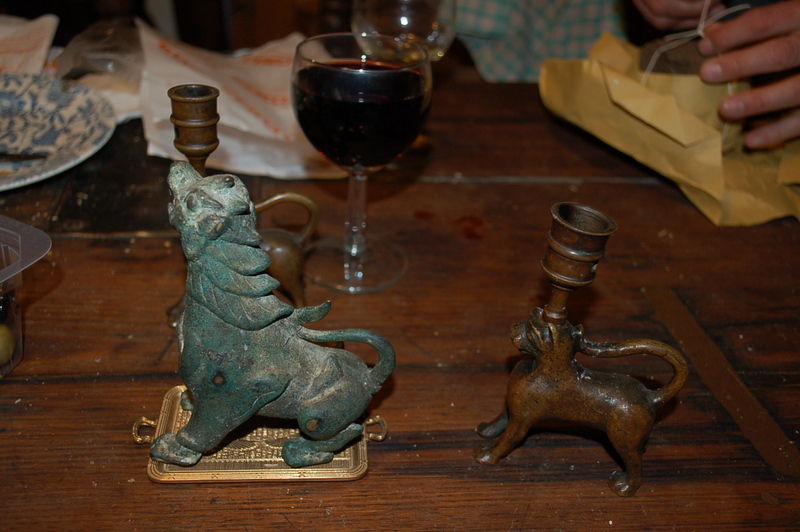 The wine flowed (as it should) as easily as the conversation. I went to bed feeling like I couldn’t possibly have that much fun the next day; I was wrong. 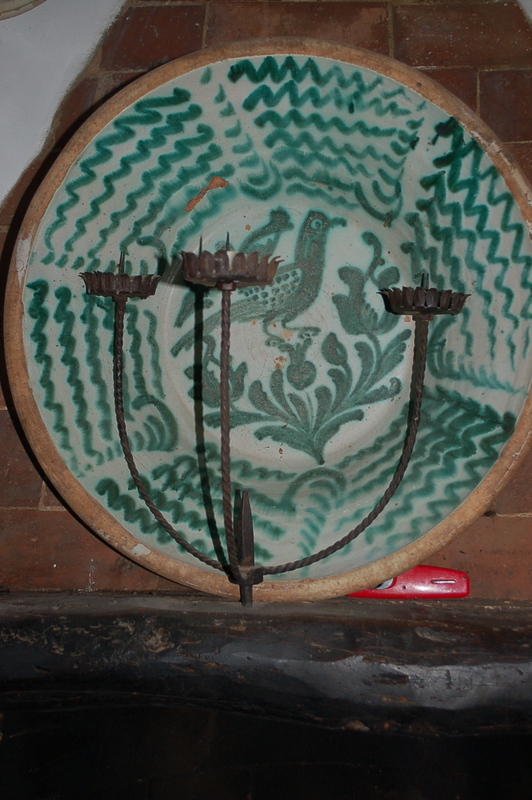 This entry was posted in dinners, Italy, Stuff I like and tagged agritourismo, Colle Puccioli, cortona, farm resort, Italy, marzolino, soft pecorino, vacation in italy, vacation in tuscany. Bookmark the permalink. All I can say is “WoW, I want to go there in April”! I wish I would be there; but at least your words are taking me there; thanks ! 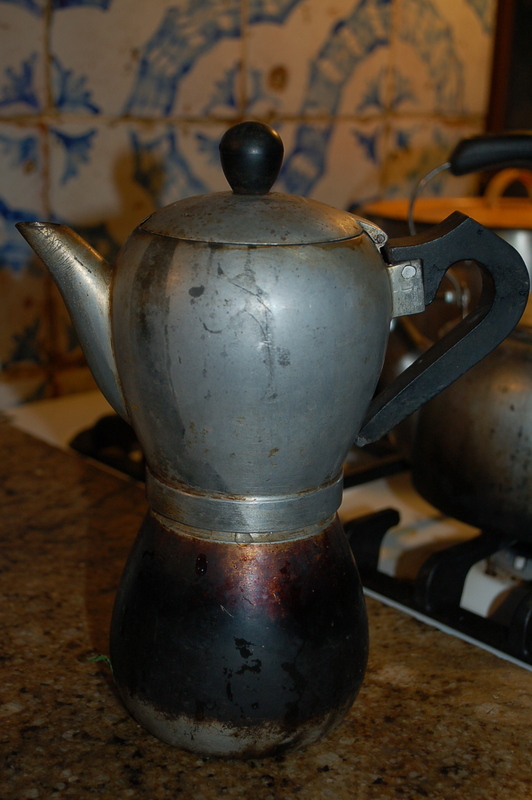 Pingback: Coffee Pots and Remembering Tom In Italy | Crappy Kitchen – Good Dinners!